1. Abandoned, inner-city corner lots, half buried in debris. A time-honored design from which more than a few great athletes have emerged. There have been adherents to the non-playground playground for decades, promoting a starkly minimalist approach – an empty field, a pile of boards and other construction materials. The concept is to set kids loose with hammers and nails, and allow them to build funky treehouses, forts and teeter-totters. Eyesores, no doubt, but their own eyesores, drawn from their own imaginations. Pre-fab play equipment, the philosophy suggests, robs children of opportunities to create their own worlds. Non-playgrounds can be empowering. 2. Aspiring mini-Disneylands, or fairy-tales come to life, lush with imaginative, spare-no-expense constructions. Generous budgets or enthusiastic donors and volunteers can make it possible to build truly inspirational spaces. Castles, tree houses, mile-long slides – you get the idea. If you can pull this off, the possibilities are endless. The clip below visits fifteen. 3. Basic, perfectly flat ball-game surfaces, either in the form of fields, or paving. Whether these are modest concrete slabs marked for four-square, or vast, mowed lawns for soccer, such spaces are essential if serious ball-play is a priority. More than one school, tight for space but amply funded, has even placed basketball courts (and swimming pools) on the roof. 4. Wild spaces, or at least naturalistic settings. The “No Child Left Inside” movement champions this option. Technically, this may not qualify as a playground in the purest sense, but in a more perfect world every school might have easy access to the natural world. 1. How safe does it need to be? Depending on the targeted age group, the level of acceptable risk can vary considerably. Pre-schoolers will require the highest level of protection. Monkey bars, for example, should be built over forgiving surfaces, in case of falls; swings should be placed with sufficient setbacks to avoid flinging young’uns into the fences. Local or state building codes usually spell out minimum requirements in this regard. If varied age groups use the space, use distance between activities, border markings or actual barriers to keep football players from falling on toddlers. Especially for urban spaces, proximity to traffic, or unsavory neighboring activities, should be considered. Wire mesh fencing allows natural surveillance while establishing a clear boundary, but a war zone may dictate the need for a substantial, solid wall. For wilder areas, clearly marked boundaries reduce the risk of getting lost – students can just follow the fence line home. 2. How can you make it as healthy a location as possible? Is the sandbox turning into a cat box? A cover may be needed. Are you finding broken beer bottles and discarded hypodermic needles when you arrive in the morning? Security cameras and nightly patrols may be warranted. Does nearby pollution pose a risk? Are the fields being sprayed with toxic herbicides? Could nearby truck exhaust exacerbate asthma? Does a nearby curve in the track pose a risk of a train derailment? Is there access to drinking water, and are bathrooms conveniently located? If students have to run back into the school to use a toilet, there’s a temptation to leave school doors unlocked or wide open, undermining access control in general. It’s also nearly impossible to supervise kids outside on the playground and inside, in the bathroom, simultaneously. 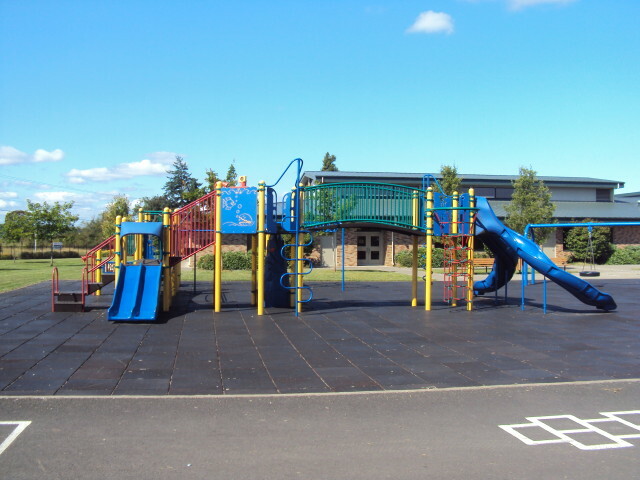 The general condition of the playground over time should also be considered – is it easy to maintain? Wood rots, gears wear out, bolts have a way of rusting and sticking out, the better to cause injuries. Attend to not only the design, but the quality of installations. 3. How well can you keep an eye on things? The more sprawling, convoluted, and lushly landscaped the area, the more challenging this will be. Hidden, mysterious or cozy spaces are attractive and dangerous for much the same reasons – these present wonderful opportunities to get away from everyone and just be by yourself, or commune with nature. They also offer tempting locations for misbehavior, bullying or other victimization. 4. Can the playground be built as a layered experience? A playground can serve as a venue for many purposes, including socializing, exercise, blowing off steam, and enjoying the breeze, but with a little thought we can take it further. Playgrounds often integrate letters, numbers, displays, and other educational materials into their designs, reinforcing learning as fun, as shown in this clip highlighting the use of used tires as a learning game in one Georgia school district. 5. Are multiple intelligences and senses accommodated? We all respond differently to varied sights, sounds, textures, the written word, smells or movement experiences. Rich use of color, as one example, can spice-up an otherwise uninspired macadam. Art installations around the world have included swings or stairs that play music. Magnifying glasses, telescopes, boulders, fallen trees and gurgling brooks can enrich the playground experience. Areas of shade, sun or shelter will become popular at different times of year. 6. Are there spaces for being alone, and spaces that encourage shared experiences? Especially when playgrounds serve double duty as both school and community resources, are there places for visitors to sit and watch their kids, to picnic or socialize? Do you want the playground to serve as a space for large gatherings? Long benches are great for sleeping, chairs for sitting. Clusters of seats lend themselves to group interaction; pairs or single seats provide alternatives for one or two individuals who would like to be left alone. Some of each can provide multiple options, but it’s best to design consciously regarding these concerns. Temporary furniture, while harder to hold onto, offers a distinct advantage the first year – see where people put the furniture to meet their own needs before making the locations permanent.